BASICSA HUMAN PERSPECTIVE In an article titled “ The 100% American,” anthropologist Ralph Linton described how a typical American, in eating breakfast, had borrowed from other cultures. He has coffee, an Abyssinian plant, with cream and sugar. Both the domestication of cows and the idea of milking them originated in the Near East, while sugar was first made in India. . . . As a side dish he may have the egg of a species of bird domesticated in Indo-China, or thin strips of the flesh of an animal domesticated in Eastern Asia. Borrowing from other cultures is common around the world, even if we are not aware of it. A group that shares a geographic region, a sense of identity, and a culture is called a society. Sometimes you will hear the term ethnic group used to refer to a specific group that shares a language, customs, and a common heritage. An ethnic group has an identity as a separate group of people within the region where they live. For example, the San peoples—known as the Bushmen of the Kalahari Desert in Africa—live in a specific territory, speak their own language, and have a social organization distinct from other groups living in the region. Cultures and societies are always in the process of changing. Change comes very slowly to some societies and rapidly to others. It can come about through innovation or the spread of ideas or behaviors from one culture to another. Taking existing technology and resources and creating something new to meet a need is called innovation. For example, to solve the need for storage of goods, some societies invented baskets woven from reeds because reeds were abundant. Other cultures developed clay pots to solve the same problem. Innovation and invention may happen on purpose or by accident. History is filled with examples of “accidents” that changed the life of a society. For example, the first cooked meat may have happened by accident, but it led to the practice of cooking most food rather than eating it raw. Good ideas or inventions are hard to keep secret—they spread when people from different societies, or their ideas and inventions, come into contact with one another. This spread of ideas, inventions, or patterns of behavior is called diffusion. In an age of electronic technology, diffusion can happen very quickly. Television and the Internet speed ideas and facilitate the sale of goods around the globe. Almost no group of people can avoid some kind of contact with other societies. A cultural hearth is a site of innovation from which basic ideas, materials, and technology diffuse to many cultures. River civilizations such as those along the Indus River in South Asia, Huang He in East Asia, the Nile River in Africa, and the Tigris and Euphrates in Southwest Asia are the best known cultural hearths. Exposure to an innovation does not guarantee that a society will accept that innovation. Individuals in the society must decide whether the innovation is useful and consistent with its basic principles. Acculturation occurs when a society changes because it accepts or adopts an innovation. An example of acculturation might be wearing jeans instead of traditional garments. Sometimes individuals or a group adopt innovations that radically change the society. The resulting changes may have a positive or a negative effect on the society, depending on how the change came about. If change is forced on a group, it may have negative consequences. On the other hand, if the individuals or a group accept the change, it may lead to a better life for everyone. For example, the lives of thousands of people in Somalia were saved when they were persuaded to be vaccinated for smallpox in the 1970s. Language is one of the most important aspects of culture because it allows the people within a culture to communicate with each other. Language reflects all aspects of culture, including the physical area occupied by the society. For example, a society that lives in the subarctic or tundra region may have many different words to describe various forms of snow. However, those words would be useless for a culture in a place with no snow. Language helps establish a cultural identity. It builds a group identity and a sense of unity among those who speak the language. If a language is spoken throughout a political region, a spirit of unity and sometimes nationalism (a strong feeling of pride in one’s nation) grows. Language can also divide people. If more than one language is spoken in an area, but one language seems to be favored, then conflict sometimes results. In Canada, for example, where both English and French are spoken, French Canadians pressured the government to recognize both French and English as official languages. Geographers estimate that between 3,000 and 6,500 languages are spoken across the world today. 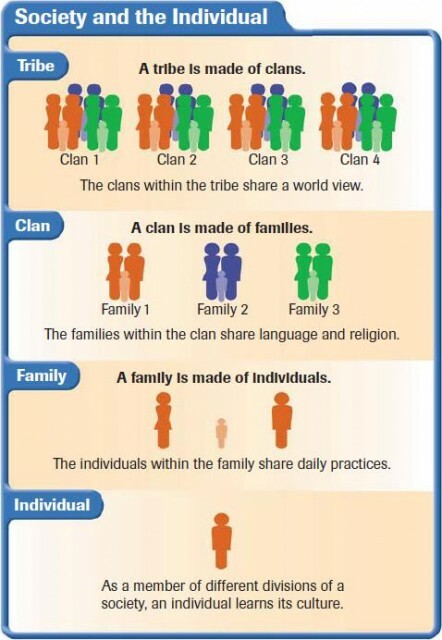 The languages are categorized by placing them with other similar languages in language families. Today’s languages evolved from earlier languages. One of the earlier languages, called Nostratic, developed in the area known today as Turkey. Nostratic is believed to be the basis of the Indo-European languages that you see on the chart on page 74. Languages as different as English, Russian, Hindi, and Greek all developed from the Indo-European family. Versions of a language are called dialects. A dialect reflects changes in speech patterns related to class, region, or other cultural changes. For example, in the United States, dialects might include a Southern drawl, a Boston accent, or even street slang. Like other aspects of culture, language can be diffused in many ways. It may follow trade routes or even be invented. For example, Swahili developed as a trade language between Arabic traders and Bantu-speaking tribes on Africa’s east coast. Sometimes a blended language develops to aid communication among groups speaking several languages. In Louisiana, the presence of French, African, and North American peoples resulted in a blended language called Louisiana Creole. A second way diffusion occurs is through migration. As people settle in new locations, the language they carry with them sometimes takes hold in the region. For example, colonists from Europe brought the English, Spanish, French, and Dutch languages to North and South America, Africa, Australia, and parts of Asia. Religions spread across the world through diffusion and through converts, people who give up their former beliefs for a new religion. Some religions, such as Christianity, Islam, and Buddhism, actively seek to convert people to their beliefs. Other religions, such as Judaism and Hinduism, do not. Finally, isolated pockets of religions, mostly animist, are found in Japan, Central Africa, Oceania, and among Native Americans of both North and South America. Three major religions of the world began in Southwest Asia and two in South Asia. The religions of Southwest Asia—Judaism, Christianity, and Islam—are monotheistic and share similar basic beliefs, and some prophets and teachers. Of the South Asian religions, Buddhism represents an adaptation of Hinduism. The oldest of the Southwest Asian religions, Judaism is concentrated in Israel. Followers, called Jews, live in Israel, the United States, Canada, South America, and many European cities. Established more than 3,200 years ago, Judaism is the oldest monotheistic religion. It is considered an ethnic religion with a long tradition of faith and culture tied tightly together. The basic laws and teachings come from a holy book called the Torah. The religious center of Judaism is the city of Jerusalem in Israel. Christianity evolved about 2,000 years ago from the teachings of Judaism. It, too, is monotheistic. Christianity is based on the teachings of Jesus Christ, whom Christians believe was the Son of God. The teachings of Jesus are recorded in the New Testament of the Bible. The religion spread from Jerusalem, first through the work of the Apostle Paul and, later, by many missionaries. It is the largest of all the religions with 2 billion followers. Christians live on every continent. Christianity has three major groups: Roman Catholic, Protestant, and Eastern Orthodox. The third religion that originated in Southwest Asia is Islam. It is based on the teachings of the Prophet Muhammad, who began teaching around 613 A.D. Its followers are known as Muslims. Islam is a monotheistic religion in which followers worship God, who is called Allah in Arabic. The religion has close ties to the prophets and teachers of Judaism and Christianity. The holy book of the Muslims is theQur’an. Islam spread from Southwest Asia to Africa, Central, South, and Southeast Asia, and parts of the Balkans in Europe. The two major divisions of Islam are Sunni and Shiíte. One of the world’s oldest religions, Hinduism dates back about 5,000 years. It is an ethnic religion concentrated in India, but has followers elsewhere. Hinduism is usually considered polytheistic because a Hindu may believe in one god or many gods, each of whom represents an aspect of the divine spirit, Brahman. The religious requirements of a caste system—levels of fixed social classes with specific rites and duties—shape many aspects of Hindus’ lives and culture. An offshoot of Hinduism, Buddhism developed about 563 B.C. in India, near the Nepal border. Its founder, Siddhartha Gautama (also called the Buddha or Enlightened One), rejected the Hindu idea of caste. Buddha’s teachings promote the correct way of living in order to reach an enlightened spiritual state called nirvana. 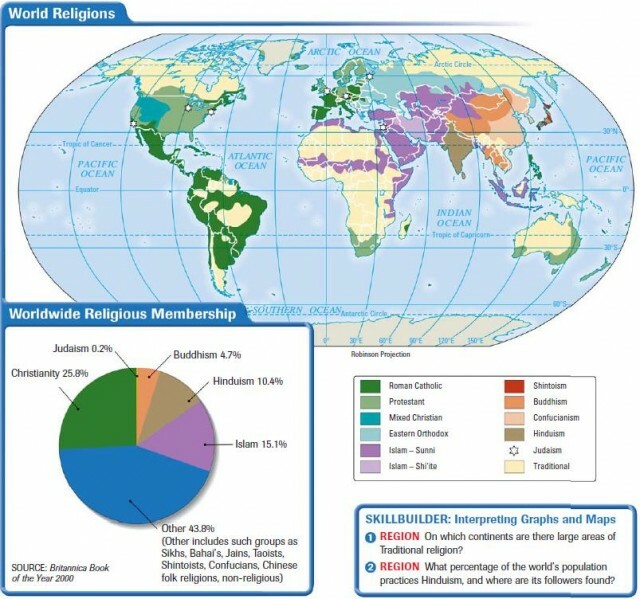 Missionaries spread the Buddha’s teaching from India to Southeast Asia, China, Japan, and Korea. Buddhism has several branches, the largest of which are Theravada, Mahayana, Lamaism, and Zen. In parts of East Asia, three belief systems are widely practiced. They are Confucianism, Taoism, and Shinto. Sometimes those belief systems are thought of as religions and sometimes as philosophies of life. All of them have specific ways of life and behaviors associated with them. All cultures have ways of expressing themselves creatively. The environment and culture in which an artist lives is reflected in the artistic product. Cultures produce performing arts, visual arts, and literature. Performing arts developed by a culture often include music, dance, theater, and film. Music is a cultural aspect found in all societies. The instruments on which the music is played and the style of music are unique to each group. Visual arts include architecture, painting, sculpture, and textiles. The style of the visual arts will reflect materials available in the region and cultural themes. Oral and written literature, such as poems, folk tales, and stories, often illustrate aspects of the culture such as attitudes and behaviors. They can also be a reflection of the environment in which they are produced. Throughout this book, you will find discussions of creative cultural expressions. As you study them, remind yourself that each culture is unique—as are the artistic expressions that the people from that culture produce.